Authentic Frosts by Mora of Sweden are premium-grade knives and tools that are trusted by food professionals from around the world. 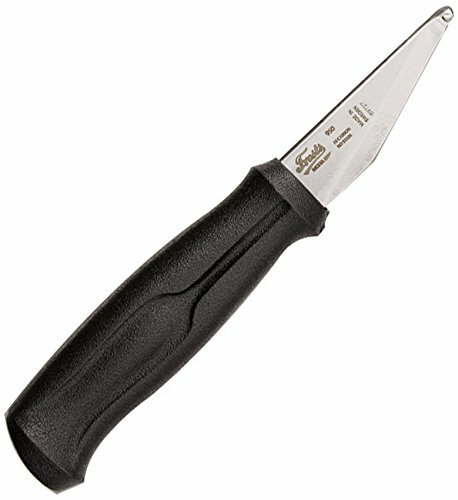 The Frosts 950P Roeing & Bleeding Knife features a blunt tip that is designed to open up your catch without puncturing the meat below. Made from Swedish Sandvik 12C27 stainless steel that resists corrosion and is cold-rolled for extreme sharpness and high-edge retention. The polypropylene handle is reinforced with glass fiber for increased friction and durability. Flexibility: stiff. Blade length: 2.0" (50mm); Blade thickness: 0.10" (2.5mm); Overall length: 7.0" (178mm); Weight: 3.1 oz. (88g). Made in Sweden. If you have any questions about this product by Frosts by Mora of Sweden, contact us by completing and submitting the form below. If you are looking for a specif part number, please include it with your message.